Book a skilled lawn pro in Kirby. Backed by a total satisfaction guarantee and amazing customer support. Kirby is known for a lot of things - one of which is a beautiful city that many different people call home. 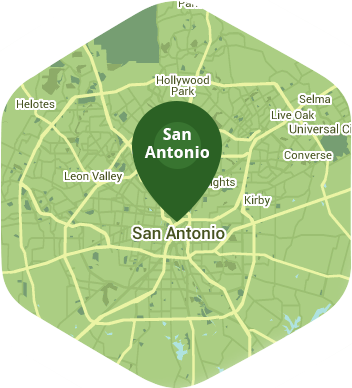 With the feel of a small town but in close proximity to downtown San Antonio, Kirby has a lot to offer residents and visitors alike. Whether you like a good steak or love to spend time at one of the many parks with your family, the last thing you probably want to do is go home and take care of your lawn. Well, you don't have to, because Lawn Love is here to help. Lawn Love is a fully insured and bonded lawn care service. Our experienced and skilled lawn care technicians can take care of all your weeding, seeding, mowing and trimming - so you don't have to. We want to work with you to create and maintain a lawn you and your family can be proud to call home. All you have to do is call us to get started. For a free, fast and easy two-minute quote, simply call Lawn Love today at 210-802-4223 to see how far a little Lawn Love can go! Rated 4.77 / 5 stars in 7,262 Kirby customer reviews. There won't be any rain in Kirby today, which means you'll probably have to water your lawn. Dusk and dawn are the best times to water your lawn (the sun will rise at 7:05 AM and set at 8:01 PM today in Kirby). Here are some average lawn care prices for homes in Kirby. Average lawn size 4,782 sq. ft.